MTV’s Teen Wolf has shattered the Go Spotting record, featuring go four weeks in a row, on a show that’s not about go. With a viewership of 3.5 million, repeated mentions of the game, and even a summary of the main goals, local clubs could soon be seeing a surge of new players if even a fraction of those viewers become curious about go and learn to play. This week’s episode, entitled “The Divine Move” both starts and ends with go. 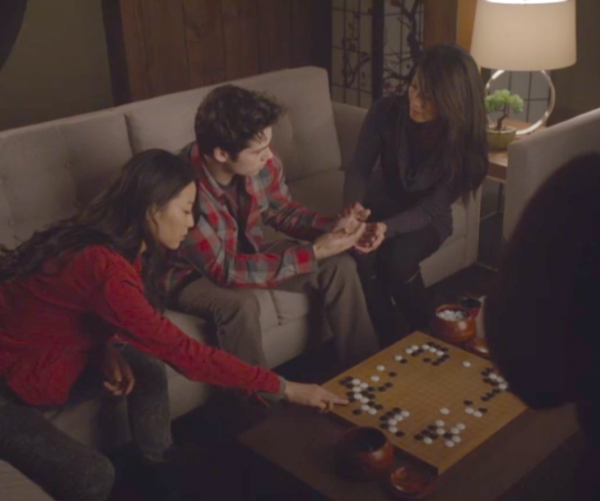 Early in the episode Mrs. Yukimura (Tamlyn Tomita) advises a desperate Stiles (Dylan O’Brien) while the family is seated around a go board “he made a powerful move by splitting the two of you.” “So what’s our move?” responds her daughter Kira (Arden Cho), as she places a stone on the board. “The Nogitsune has had sente until this point, what you need is a ‘Divine Move’ in order to turn this game around,” responds her mother. 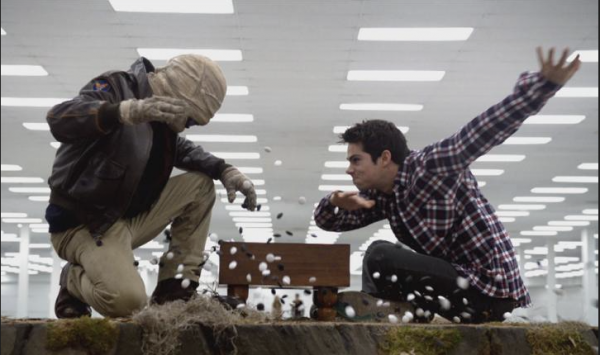 Stiles does find a divine move, in the story arc at least, and his friends defeat the Nogitsune at last. 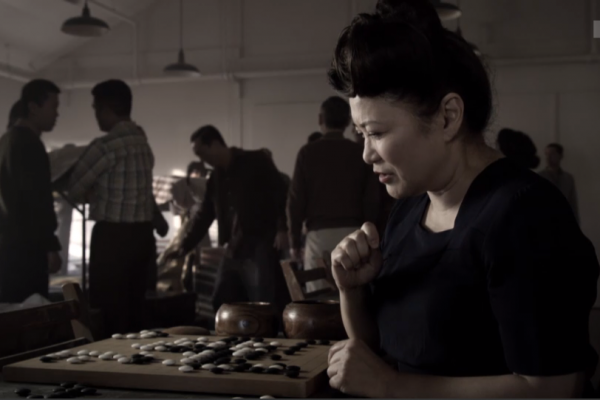 Towards the end of the episode, Kira’s parents are seen picking up the pieces from the go board, drawing a conclusion to the story arc (and the season). Full episodes of Teen Wolf can be streamed on the MTV website here. As an added bonus, in the after show (Wolf Watch) series creator Jeff Davis also talks briefly about go. -Paul Barchilon, E-J Youth Editor. Photo from the MTV website: Kira places a stone on the board, while Stiles talks to Mrs. Yukimura. MTV’s Teen Wolf seems to be on a go jag. This week’s episode featured another conversation about strategy, with Kira (Arden Cho) learning about go from her mother, who even explains what the game is about, and describes territory. Later in the episode, Kira’s father tells her that go is called Baduk in Korea, and that her mother is a very aggressive player – too aggressive for her own good. This marks the third week in a row that go has been featured on the show, and next week’s episode is titled “The Divine Move,” which any Hikaru no Go fan will immediately recognize as a key concept in the manga. My guess is that next weeks episode will revolve around another go match, possibly between Kira and her mother. Check out Teen Wolf on the MTV website here. -Paul Barchilon, E-J Youth Editor. 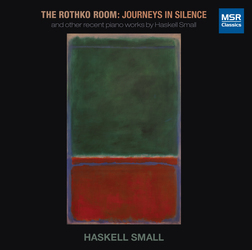 “Meditations on silence and space are as structurally important to the creative life of Haskell Small as are the grids on his beloved Go board,” the liner notes continue. “And, just as with that ancient and revered “game” (using that word advisedly), vast complexity arises.” An accomplished pianist and composer, Small is a longtime go player and organizer in Washington DC. 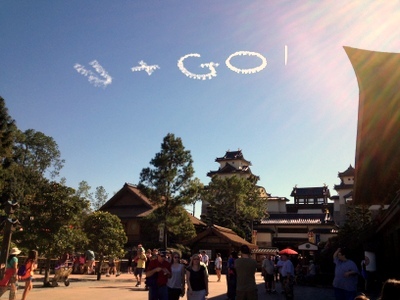 Anton Ninno spotted this mysterious sky-writing recently outside the Japan Center at Disney Epcot in Orlando, Florida. MTV drama Teen Wolf again wove go into the latest episode, making two weeks in a row where the game has been featured prominently. Co-star Dylan O’Brien, as Stiles Stilinski, has been possessed by a dark fox spirit, the Nogitsune, who is controlling his mind and body. Go is alluded to about twelve minutes in, when two werewolves are discussing strategy. One is trying to use a chess board to figure out what Stiles would do, but the older werewolf observes “Chess is Stiles’ game, it’s not the game of a Japanese fox”. 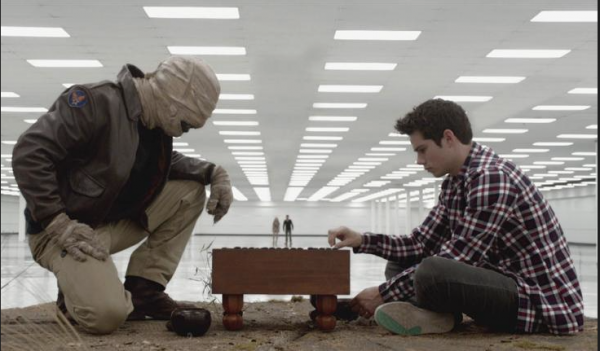 Later, using psychic werewolf powers, Stiles’ friends are able to enter his mind, where they find him engaged in a game of go with the Nogitsune. Like all good go players, he is immersed in the game, and deaf to the cries of his friends. It appears that while his mind is trapped in the go game, the Nogitsune has complete control of his body. We see the board from multiple angles, with Stiles playing white. Unfortunately, the only move he makes on the board is an empty triangle, although the board position is at least reasonable. The spell is broken when Tyler Posey, as Scott McCall, transforms into a werewolf and his howl gets through to Stiles. Suddenly realizing what is going on, Stiles looks up at the Nogitsune, and then sweeps all the stones off the board. Just as well, nothing good would have come from that empty triangle anyway. The go match appears at the 35 minute mark, and the entire episode can be viewed on the MTV website here. -Paul Barchilon, E-J Youth Editor. Photo from the MTV website. MTV’s popular drama Teen Wolf features go prominently in the latest episode The Fox and the Wolf. Part of the episode is set in a Japanese internment camp, during the second World War, and a character named Satomi uses go throughout the episode, to help control her emotions. “You take too frequently, and you take too much,” Satomi tells a younger woman, in a conversation at the go board that is as much about stealing supplies for sale on the black market as it is about the game. “The young fox always knows the rules so she can break them, the older wiser animal learns the exceptions to the rules,” says Satomi as she captures a stone. The entire episode can be streamed on the MTV website here, go first appears in the episode at the 9 minute mark. -Paul Barchilon, E-J Youth Editor. Photo: Satomi studies the board, from Teen Wolf Episode 21. In the manga Ashita No Joe — also known as Tomorrow’s Joe in America — the main character Joe Yabuki talks about fuseki. The manga isn’t about go at all — its about boxing — but here Joe is in the middle of a brutal match and in danger of losing. His coach wants to take him out of the match but Joe uses the concept of fuseki to explain his plan. Thanks to Henry Hathaway for passing this along.